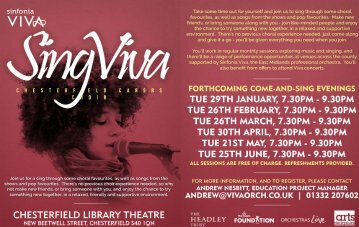 Arts Derbyshire are very happy to share the fantastic news of the launch of the new phase of the Derbyshire Carers Choir - Sing Viva, based in Chesterfield, at the Chesterfield Library Theatre, starting monthly from January. This follows a very successful year of running a group in Derby. The choir is run by Sinfonia Viva, Derbyshire's professional orchestra, and supported by Arts Derbyshire, with funding from Orchestras Live, the Headley Trust, Morrison's Foundation and the Santander Foundation. No previous choral experience is needed - just come along and join us for a sing through some choral favourites, as well as songs from the shows and pop favourites. Make new friends, or bring someone with you, and enjoy the chance to try something new together, in a relaxed, friendly and supportive environment. Chesterfield Library Theatre, New Beetwell Street, Chesterfield, S40 1QN. For carers in the south of the county, you can find the dates for the Derby Carers Choir on the Sinfonia Viva website.